This is one of those homey, comforting dishes that you wish would just magically appear on your table at say, around 5:30-6:00pm, just when people begin to ask the universal question, "What's for dinner, tonight?" Sadly, technology hasn't gotten us to the point where you can just reach through the screen and grab this dish for yourself nor can I make a home delivery of this baby to each and every one of you (would that I could, sorry!) but what I can do is share the recipe with you and assure you that it's not too much effort for a lot of deliciousness reward. Plus you can make it ahead and just warm it up before you're ready to serve. And it'll earn you major points with those pesky little dinner questioners and that my friends, is not a bad way to start out a week! Especially when today is National Comfort Food Day! When you think of cobbler, does your mind go to a fruity, biscuit-like topped dessert? Well, one bite of this and I think you'll be a cobbler-is-dinner-too convert for life! Besides being absolutely fabulous tasting, it's totally nostalgic food that hearkens back to a less rushed time when dinners like this got churned out every night. The really nice thing about this cobbler though is that you can make it ahead and serve it a couple of days later and it'll still be just as good. With the weeknight so chock full of activities, I try to make one casserole sort of dish on the weekend that can get us through the busy weeknights when there's not really enough time to make something from scratch, but we still want a home-cooked, feels-like-you-spent-all-day-slaving-over-it-kind-of-a-meal. And if you're a fan of chicken pot pie, you're going to love this cobbler because it will remind you of it but is so much easier, since there's no pie crust to make and roll out. Here the topping just gets dropped on top of the cooked chicken and vegetables and spreads out to form a crusty yet fluffy biscuit-like exterior. 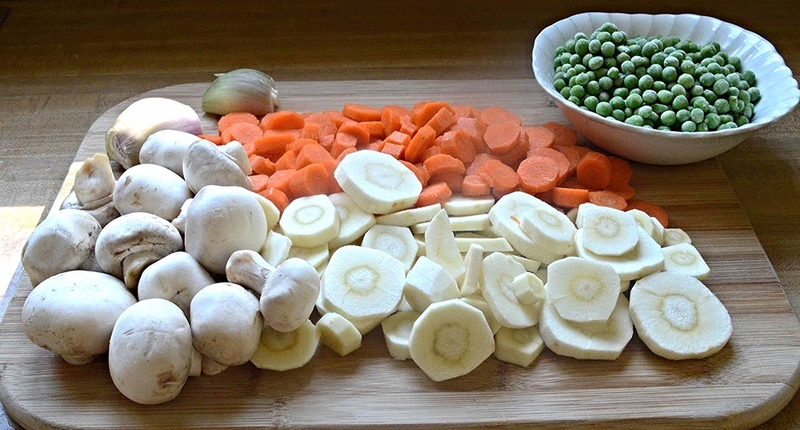 I also love this dish because it's so versatile--I used carrots, parsnips, mushrooms, shallots and peas but you could easily replace the shallots with leeks or onions and trade the parsnips for turnips or leave them out entirely. It's all up to you--what you've got in the house and what you'll shlep to the store to get. The filling is comforting and interesting with the sweetness of the peas and carrots, the tang of shallots, the earthiness of the mushrooms and the tenderness of the chicken all bathed in a light sauce and topped with that light and crunchy crust. Definitely a dish you're going to want to include in your winter repertoire. And if you want to follow up your dinner cobbler with this blueberry cobbler or maybe this apple brown betty (which is almost like a cobbler) who's going to complain? 1. Preheat oven to 400ºF. Place the oil in a large skillet and heat over medium heat. When oil is very hot, add the shallots, season with some salt and pepper and let cook for a few minutes, stirring every now and then, until the shallots are softened and translucent. Add the the mushrooms and let them cook for about 8-10 minutes, until the liquid they release has basically evaporated. Stir every now and then. 2. Add the chicken stock and bring to a boil. Let it continue to boil for a couple of minutes. Then add the carrots, parsnips and chicken and lower the heat to a simmer. Cook until the chicken is cooked through and the carrots and parsnips are tender, about 10 minutes or so. Add the peas and stir together. Cook for a couple of minutes, just so that the peas are cooked through, but still bright green. You don't want them to get mushy. 3. In a small bowl, whisk the cornstarch with a few tablespoons of the cooking liquid. Add the mixture to the skillet and stir until the mixture begins to thicken a bit. Transfer the entire mixture to a 8x8 or 9x9-inch ovenproof casserole and set it aside. 4. Place the flour, baking powder. baking soda and salt into the bowl of a food processor. Add the butter and pulse a few times until the mixture becomes crumbly, like small peas. If you don't have or want to use a food processor, you can also do this by hand with a pastry blender or even your fingers. Transfer the mixture to a medium bowl and add the buttermilk and egg, Stir together with a fork. The mixture will be very sticky. 5. Drop spoonfuls of the batter all over the top of the chicken/vegetable mixture in the baking dish and smooth them out with a knife, almost completely covering the mixture below, except for a few spots so that some of the steam can escape. Bake for 40-45 minutes, until the top is golden and the mixture is bubbly beneath. Serve immediately. 6. If you want you can make this up to 2 days ahead and reheat it. If you're going to do that, then I would cook it for about 30 minutes, let it cool, cover it and refrigerate it and then take it out about and hour before you're ready. Then let it cook in a 350ºF oven so that the top can get golden brown and the mixture fully heated through. 7. Leftovers can be stored in an airtight container in the refrigerator for 3-4 days and reheated in a low oven or the microwave. Note: Recipe adapted from a NY Times article I clipped out years ago. I've tinkered and tampered with it a lot. Feel free to change up some of the veggies and add fresh thyme or rosemary.